Home Differences What is the Difference Between Bill of Exchange and Promissory Note? To pay for credit sales a buyer may make a written promise in form of a promissory note or a bill of exchange. Below is a compilation of the major points of difference between bill of exchange and promissory note. 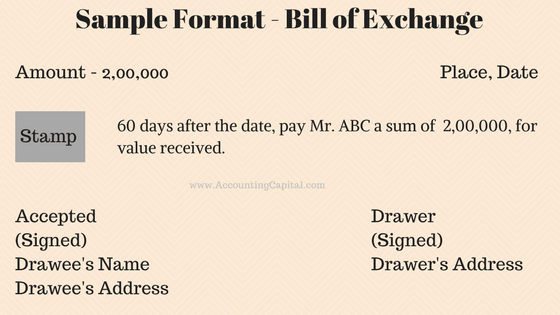 Definition (Bill of Exchange) – It is a financial instrument in writing containing an unconditional order signed by the maker, directing another person to pay a specific sum of money. It is paid to the bearer of the instrument (or) to the order of a particular person (or) to a particular person. Definition (Promissory Note) – It is a financial instrument, in which one party promises in writing to pay a pre-determined sum of money to the other party subject to agreed terms. It can either be payable on demand or at a specific time. It may be paid to the bearer of the instrument (or) to the authorized party (or) to the order of the authorized party. 1. A bill of exchange is an order to pay. 1. A promissory note is a promise to pay. 2. The creditor is the drawer in this case. 2. The debtor is the drawer in this case. 3. There are 3 parties involved in a bill of exchange; Drawer, Drawee, and the Payee. 3. There are 2 parties involved in a promissory note; Promisor and the Payee. 4. Acceptance is mandatory by the drawee. 4. Acceptance is not mandatory by the drawee. 5. Liability of the drawer is only recognized when the acceptor fails to pay. 5. Promisor has the primary liability to make a payment. 6. Noting of a bill of exchange is advisable in case of non-payment. 6. Noting of a promissory note is compulsory in case of non-payment. 7. Stamping is necessary for a bill of exchange except for “bills payable on demand”. 7. Stamping is necessary for promissory notes without any exceptions. 8. A single copy is prepared, except in case of foreign bills. (3 copies are made) 8. One copy is prepared in all cases.